Limited to 12,000 decks only. 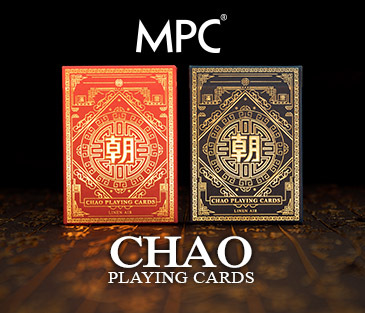 This very special and unique deck of cards pays tribute to four of the greatest and most recognized dynasties in Chinese history – Han, Tang, Ming and Qing. A re-engineered deck of cards from card stock finishing to varnishing used. 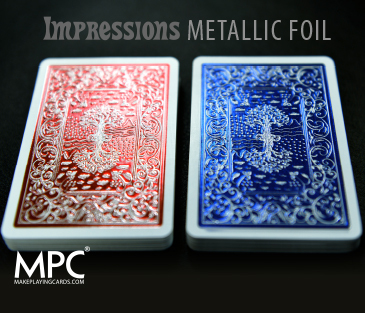 The Impressions Foil Gold and Silver back playing cards follows on the success of our two previous sets of Impressions Foil Kickstarters which saw the initial release of this popular series and a follow-up project offering these decks in unconventional colors. The gold and silver back decks uses the same ground breaking printing technology and manufacturing process. The shades chosen is especially chosen to best depict luxuriousness and also to complement each other. The Cardinal Ed. deck is a continuation of the wildly successful Impressions playing cards series. 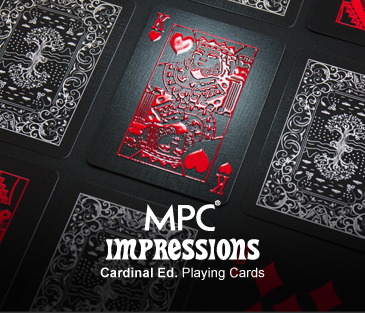 The Cardinal deck uses a very bold blood red and white to create the card face artwork applied onto the cards with a black background. The combination of these colors together with our MPC Impressions high gloss embossed technology is truly astounding and mind-blowing. But aside from admiring the beauty of the cards, the Cardinal Ed. deck can be played and handled like a normal deck of cards too. While there are many playing card designs out there, there seemed to be not that many decks in the industry using softer tones such as pastel colors which is a surprise. The Femme deck is a concept deck inspired by beauty, femininity, love and romance. We finalized on pink and mint colors which were chosen carefully from research of reports of popular colors which could represent this concept. The outcome of using the combination of these colors with raised high gloss embossing with metallic printing technology are absolutely beautiful and we're proud to share it with everyone. 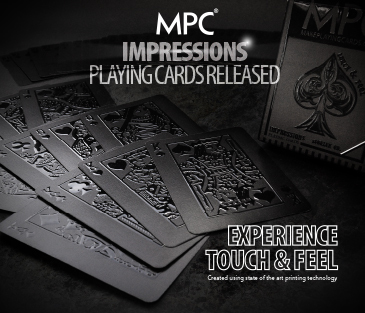 We introduce to you, the all new Impressions Foil Femme Playing Cards. After 45 days of project campaigning, our 3rd Kickstarter Impressions Foil Back Playing Cards came to an end with $39k funded and over 800 backers. 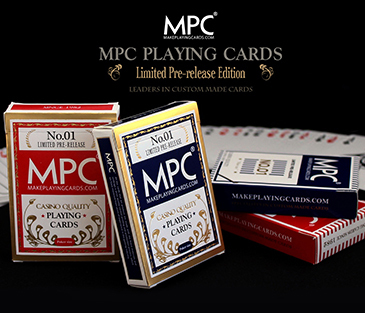 This was a historic moment for MPC as a lot of work went into making these decks into what they are. 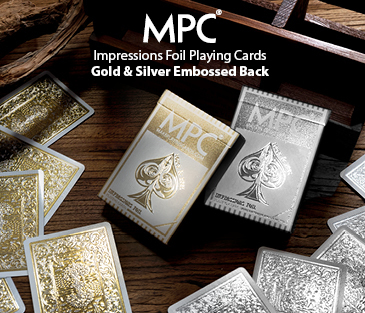 Metallic thin foil plus a layer of UV high gloss embossing on the detailed back pattern of air pocketed professional grade playing cards card stock, finished off with a secret varnish to make them handle magnificently. The results are simply amazing and we are so proud of our team who made this happen. 3 colors are available, blue, red and green. Tuck boxes were upgraded to new metallic material and a gold MPC signed seal. We released our second Kickstarter playing cards project on September 2014, introducing a whole new concept for a deck of cards which you can touch, feel and admire as well as play. We applied state of the art virko raised gloss effect technology onto 310gsm German casino card stock adding a new dimension to the artwork. 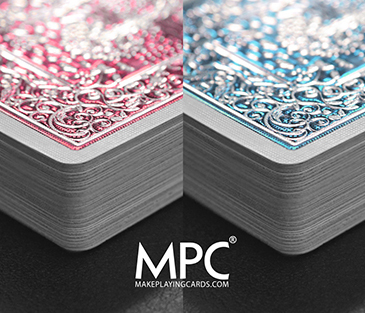 This is a never done before concept on playing cards and MPC has become a pioneer for raised gloss embossed playing cards. 4 editions were made available, Stealth Ed., Standard, Phantom Ed. and the Court Ed. The project achieved monumental success with $81k funded and over 2000 backers. We released our very own Kickstarter playing cards campaign in the early of 2014 which was a success. We designed a deck using 310gsm casino German card stock with linen finish, added gold foil stamping onto the tuck boxes and a seal. Uncut sheets were also made available. See more details. We’ll be releasing more Kickstarter projects throughout the year so keep connected.